All PWD rescues and relocations should be directed to the National Rescue Coordinators (rescue@pwdca.com). If it is urgent, please contact them by phone at 877-328-PWDS (7937). If you are interested in adopting a rescue PWD, please complete an application. The local rescue point person for Southern California is Ellen Leyda (ellenleyda@gmail.com). We have successfully rescued and placed several PWD's during the past years. Some were rescued from Shelters, then evaluated for temperament, health and special needs, before finding a good home to match the needs of the dog. We have a great network of supporters who check the internet for photos of possible PWD's found in Shelters. 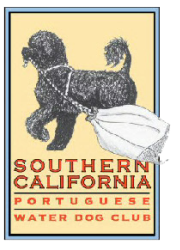 Other breed rescue groups who make weekly visits to local shelters contact us to let us know about dogs in Shelters who are labelled as Standard Poodles, Curly Coated Retrievers, Bouvier mixes, etc., but could possibly be PWDs. We make numerous trips to Shelters in order to identify a possible PWD. Most are Poodle mixes, Cockapoos or other mixed-breeds, but there are a few PWD's. Although it is heartbreaking to visit Shelters and leave dogs that are not PWD's behind, the reward in being able to rescue just one and placing it in a loving home is priceless. Sadly, we are not always successful in tracing former owners or breeder(s) to find out why these dogs ended up in a Shelter in the first place.